Fork alignment is very important to me. I think it’s as important as frame alignment. Unfortunately with the prevalence of carbon forks, fork alignment has become less important to many builders. Forks are taken out of boxes and stuck onto frames and as long as the wheel centers up between the blades all is golden. Well not really. Many of these forks have the drop outs pulled to one side or the other of centerline. So even if the wheel centers up between the blades the wheel will not be vertical. Since carbon forks can’t be cold set there’s nothing to do about it. The builder could return the fork and some do. But many don’t. Many don’t even have the tooling to check. Also there’s a whole new generation of builders that have never even built a fork and are largely unaware of this issue. That bugs me a lot. Maybe too much. Anyway, I make my forks and I’m passionate about it. The first picture shows a fork on my Marc hetti fork table. 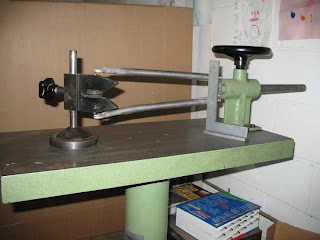 The steerer is held parallel to the table surface. The square is placed on the blades by the crown to make them perpendicular to the table surface. The black gauge at the drop outs has a dial to symmetrically set the pointers at the desired width. In this case 100mm. You can see that the gauge can move up and down the vertical shaft. 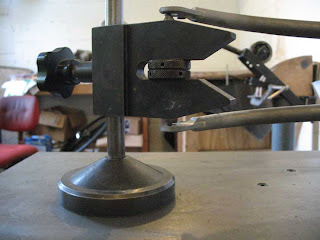 The V is placed on the steerer and that sets the gauge at the centerline height. The second picture is a close up of the gauge between the drop outs. This is to ensure the drops are spaced equidistantly from the centerline. There’s more steps to aligning fork after this. I haven’t taken photos of them but maybe will sometime. The other steps are to H-tool the drop outs to make sure they’re parallel. The square is put into the drop out slots to confirm the crown isn’t twisted. A properly dished wheel is then put in the fork to confirm the wheel is centered between the fork blades. Lastly the fork rake is measured to confirm it’s to spec. When all of that has been done, then the wheel is truly vertical and the fork will truly perform as intended.